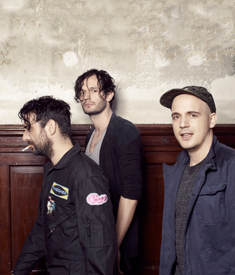 Moderat are Modeselektor and Apparat. Hardly anybody has brought electronic music from Berlin to the farthest flung corners of the world with more passion and enthusiasm than these two heavyweights. Modeselektor – Gernot Bronsert and Sebastian Szary – are bass music heroes. Together with a veritable army of collaborators, guest artists and with their two labels Monkeytown and 50 Weapons, they have built a broad network. They assimilate and process the tiniest vibrations in the global bass continuum and at the same time, their wobbly salvos and their oblique sense of humour are unmistakable. They became known to a select audience through their records on BPitch Control with which they catapulted themselves out of the Berlin 4/4 cosmos, whilst simultaneously reflecting the raw and full-on spirit of the 1990s Berlin club scene. Apparat (Sascha Ring) could hardly be more opposite. He fuses tricky electronics with heartfelt and auspicious pop. Together with T.Raumschmiere, he founded Shitkatapult. From early on, Apparat realised that the LP was his preferred form of expression. With each album, he reinvented himself on a personal, stylistic and social level: gradually bringing ever more strata of his emotional persona to light, exploring previously unknown musical styles and involving guest musicians in the process.